US counterterrorism efforts in Syria: A winning strategy? Fighters from Ahrar al Sham, the Free Syrian Army, and Al Nusrah Front display their banners after a victory in Idlib province, Syria. Editor’s note: Below is Thomas Joscelyn’s testimony to the House Committee on Foreign Affairs Subcommittee on Terrorism, Nonproliferation, and Trade on the US counterterrorism strategy in Syria. Chairman Poe, Ranking Member Keating, and other members of the committee, thank you for inviting me here today to speak about America’s counterterrorism efforts in Syria. The war in Syria is exceedingly complex, with multiple actors fighting one another on the ground and foreign powers supporting their preferred proxies. Iran and Hezbollah are backing Bashar al Assad’s regime, which is also now receiving increased assistance from Russia. The Islamic State (often referred to by the acronyms ISIS and ISIL) retains control over a significant amount of Syrian territory. Despite some setbacks at the hands of the U.S.-led air coalition and Kurdish ground forces earlier this year in northern Syria, Abu Bakr al Baghdadi’s organization has not suffered anything close to a knockout blow thus far. Sunni jihadists, led by Al Nusrah Front and its closest allies, are opposed to both the Islamic State and the Assad regime. Unfortunately, they have been the most effective anti-Assad forces for some time, as could be seen in their stunning advances in the Idlib province earlier this year. Turkey, Qatar, Saudi Arabia and other nations are all sponsoring proxies in the fight. Given the complexity of the war in Syria, it should be obvious that there are no easy answers. We were asked to assess whether or not the U.S. and its allies have a winning strategy. I would argue that there currently is no comprehensive strategy in place. The West’s involvement is ad hoc, tactical and reactionary. Consider the recent news, confirmed by CENTCOM, that some of the equipment and ammunition supplied to U.S.-backed rebels has been turned over to the Al Nusrah Front, which is an arm of al Qaeda. These provisions were supposed to be used in the fight against the Islamic State, Al Nusrah’s bitter jihadist rival. But Al Nusrah interfered in the plan. And this isn’t the first time al Qaeda got in the way. In July, Al Nusrah quickly disbanded a small cadre of more than 50 fighters who were inserted into Syria to fight the Islamic State. In both cases, U.S. officials either did not know that Al Nusrah was likely to move against America’s proxies, or assumed that Al Nusrah wouldn’t. This demonstrates a lack of strategic thinking, as the train and equip program was so focused on the Islamic State that U.S. officials had not properly accounted for Al Nusrah’s entirely predictable actions. 1) Any strategy for truly defeating the Islamic State needs to incorporate plans for clearing and holding large areas currently under its control. Thus far, no ground forces have been capable of doing this in cities such as Raqqa and Mosul, which are key to the Islamic State’s “caliphate” claim. There is opposition to the Islamic State in these areas. For instance, the Kurds have delivered some significant losses on the Islamic State in northern Syria and have come within 30 miles of its de facto capital this year. 2) Iran has escalated the conflict and Iranian influence is inherently destabilizing the entire region. Iran supports both Bashar al Assad’s regime and the Iraqi government, but it does so by sponsoring Shiite extremism, which is no bulwark against Sunni extremism. Instead, the increasing role of Shiite extremists backed by Iran is driving more Sunnis into the jihadists’ arms. This is precisely the opposite of what any strategist should want. Iran’s proxies are not capable of clearing and holding territory from the Islamic State or al Qaeda. And even if they were, this would only further strengthen the hand of Iran’s virulent anti-American revolution. 3) Some have advocated working with Sunni jihadists in Syria, but this would play right into al Qaeda’s hands. Groups such as Al Nusrah Front and Ahrar al Sham have long been working to inculcate jihadism within the Syrian population. They are using the vicious war to spread their radical ideology, which is a different strain of jihadism from the Islamic State’s belief system, but no less of a threat. In some ways, in fact, their version of jihadism may be a bigger long-term threat. Below, I discuss these points and others in more detail. The Islamic State’s claim to rule as a “caliphate” will remain viable as long as it retains control over a significant amount of territory. The Islamic State’s founding mythos is that Abu Bakr al Baghdadi and his men have resurrected the “caliphate.” For the Islamic State’s base of supporters, this idea is a building block for their beliefs. Two cities are particularly important for the Islamic State’s “caliphate” claim: Raqqa and Mosul. Indeed, Baghdadi’s only public appearance as the self-declared “Caliph Ibrahim” came when he led prayers in a Mosul mosque days after his men marauded through the city. Raqqa is the de facto capital of the “caliphate” and an operational nerve center for its nascent state. While the Islamic State’s control of these two cities and other territory does not make it a true “caliphate,” it is enough to continue fueling that perception among its supporters. Controlling territory is crucially important for the Islamic State and its prospects for the future. The group’s motto is: “Remaining and Expanding.” The meaning is self-evident: the “caliphate” will remain in control of the lands it has conquered and will continue to seize new turf. The 5th edition of Dabiq, the Islamic State’s English-language magazine, is devoted to this theme. The editors of Dabiq are anything but modest, stating that the Islamic State seeks nothing less than to “expand” until its “blessed flag…covers all eastern and western extents of the Earth, filling the world with the truth and justice of Islam and putting an end to the falsehood and tyranny of jahiliyyah [state of ignorance], even if American and its coalition despise such.” Mecca, Medina, Rome, and Jerusalem — all will fall to the Islamic State, if you believe its propagandists. Of course, this is not possible. The Islamic State is not going to conquer Italy, Israel, and Saudi Arabia. Still, a lot of carnage and chaos has been wrought in pursuit of this imperialist dream. Until the Islamic State’s claim to be “remaining and expanding” is conclusively disproven, too many people will continue to believe that it really is a “caliphate.” And Baghdadi’s men will retain some legitimacy in the minds of many of their recruits. Therefore, the Islamic State cannot truly be “defeated” until it can no longer plausibly claim to rule over a large swath of territory. Its founding myth must be shattered. 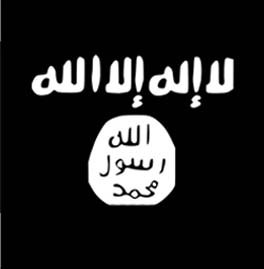 This does not require dislodging the Islamic State from all of the territory its black banner flies over. Indeed, Baghdadi’s nascent nation has already lost some turf, including in the northern part of the Raqqa province. But high-profile losses, ones that cannot be denied by even the most ardent believer, are a must for any strategy to succeed in the long run. Ideally, Raqqa or Mosul would fall to the Islamic State’s opposition. However, neither city appears to be under imminent threat. The Islamic State’s “caliphate” claim has other vulnerabilities that can be exploited. Its prolific media machine recently released a series of videos in various languages denouncing refugees fleeing Syria and Iraq. The refugees would receive “justice” under the Islamic State’s laws, Baghdadi’s propagandists claimed. While many of the refugees are fleeing Bashar al Assad’s barrel bombs and other war crimes, it is undeniable that many are running away from the Islamic State’s “caliphate” as well. In fact, the videos show that the Islamic State is concerned about the loss of human capital. Suicide bombers are not enough to man hospitals and food markets, or to provide other basic services. Indeed, there is much discontent among the Islamic State’s residents already, as the “caliphate” is better at fighting than governing. To date, however, no force has been able to harness the populace’s dissatisfaction. Killing senior leaders and striking other high-value targets is not enough to defeat the Islamic State or al Qaeda. In June 2006, the founder of al Qaeda in Iraq (AQI), Abu Musab al Zarqawi, was killed. It made little operational difference to the overall insurgency then raging in Iraq. The new leaders of AQI, Abu Hamza al Muhajir (a.k.a. Abu Ayyub al Masri) and Abu Omar al Baghdadi, were taken out in April 2010. At the time, under relentless pressure from coalition forces, the prospects for AQI and its political front, the Islamic State of Iraq (ISI), had dimmed. The targeting of AQI/ISI’s leadership was combined with a robust counterinsurgency strategy that successfully forced the group from its strongholds and suppressed its ability to challenge the Iraqi government’s sovereignty. Still, AQI/ISI wasn’t defeated. Abu Bakr al Baghdadi was appointed as the new leader and oversaw the group’s resurrection, beginning with increasingly lethal attacks throughout 2012 (after the last American forces were withdrawn from Iraq in December 2011), a surge into Syria in 2013 (including the capture of Raqqa), and a stunningly successful offensive in Iraq in 2014 (culminating in the capture of Mosul). In late June 2014 – more than eight years after Zarqawi was killed – Abu Bakr al Baghdadi declared himself to be “Caliph Ibrahim” and his organization was rebranded as a “caliphate” known simply as the Islamic State. There are plenty of other examples of jihadist groups surviving so-called decapitation strikes or significant leadership attrition. In September 2014, the al Qaeda-linked Ahrar al Sham lost much of its senior leadership in a mysterious explosion. 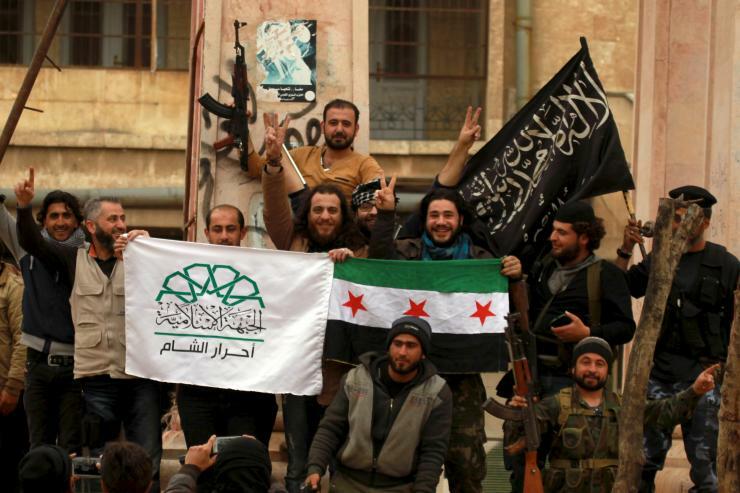 Not only did Ahrar al Sham survive, today it thrives, leading the charge on Syrian battlefields. In Yemen, several of al Qaeda in Arabian Peninsula’s (AQAP) top leaders have been killed since January. This includes Nasir al Wuhayshi, who was not only AQAP’s emir, but also one of the most senior figures in al Qaeda’s management team. This has not stopped AQAP’s insurgency. The organization is more prolific than ever inside Yemen, capturing significant territory in the southern part of the country. Al Qaeda’s senior leadership itself has survived the death of Osama bin Laden, as well as dozens of his and Ayman al Zawahiri’s subordinates. With the exception of the Islamic State, al Qaeda’s regional branches (discussed below) remain loyal to Zawahiri and al Qaeda is still closely allied with the Taliban. The current U.S. effort against both the Islamic State and al Qaeda is focused mainly on killing the most visible leaders in both organizations. The U.S. air campaign against the Islamic State in Iraq and Syria has also taken out numerous Islamic State fighting positions, weaponry, warehouses, explosives factories, and other important targets. But this is not sufficient to make the Islamic State crumble. High-value targeting is most effective when it is combined with other counterinsurgency measures, clearing the territory held by the insurgents, holding it, and instituting new governance structures. Unfortunately, there are currently no boots on the ground truly capable of implementing a large-scale counterinsurgency strategy. There are friendly forces fighting the Islamic State, but it is not clear if they would be capable of making more significant advances on the “caliphate’s” territory. For example, the Kurds and their allies have taken the top third of the Raqqa province. In late June, the YPG (or People’s Defense Units), announced that the town of Ain Issa had been “liberated.” This is just 30 miles north of the city of Raqqa, which is the “caliphate’s” de facto capital. For some reason, however, there have been delays in providing the Kurds with additional assistance. Even if that assistance flows more readily, clearing and holding Raqqa would be a Herculean undertaking. Further complicating matters, some of the non-Kurdish forces fighting the Islamic State in Raqqa province have dubious pasts, with connections to al Qaeda’s efforts in the country. The Iraqi and Syrian governments, backed by Iran and Russia, are not capable of waging a true counterinsurgency campaign. In fact, their actions have, in many ways, contributed to the rise of the Islamic State, Al Nusrah Front and other Sunni jihadist groups. Iranian-sponsored extremism is fuel for the war. Sunni jihadists thrive off of sectarianism. And Shiite extremists are no true bulwark against Sunni extremists. In Iraq, Prime Minister Maliki’s government shunned cooperation with the Sunni forces that could have been an incredibly valuable ally against the Islamic State early on. The dismantling of the Sunni “Awakening” and the failure to integrate its fighters into the Iraqi government’s official security apparatus helped pave the way for the “caliphate’s” surge in Iraq in 2014. Incredibly, the U.S.-backed Sunni coalition that did so much damage to al Qaeda in Iraq was treated like a pariah by the Iraqi government. As Derek Harvey and Michael Pregent have written, “The vast system of security forces and Sunni tribal auxiliaries that had made the Sunni provinces of Iraq hostile territory for al Qaeda was dismantled.” Maliki placed Shiites loyal to him and his cause in key positions. This “Shiafication” of the Iraqi military and security forces was “less about the security of Iraq than the security of Baghdad and [Maliki’s] regime,” Harvey and Pregent explained. A key beneficiary of this “Shiafication” in Iraq is the Iranian regime, its Revolutionary Guard Corps (IRGC) and Hezbollah. Iran sponsors the Shiite militias that have often taken the lead in fighting the Islamic State in Iraq. These militias are not stabilizing Iraqi society – quite the opposite. Even though the U.S.-led coalition provides air cover for these militias, there is convincing evidence that they are brutalizing the population after driving the Islamic State’s jihadists out. The Iranian sponsored Shiite extremists are, in fact, committing many of the same war crimes that the Islamic State has become infamous for. A key reminder of this fact came in August, when the Islamic State burned four men alive. The Islamic State said the men belonged to the Popular Mobilization Forces (PMF). The grotesque execution was actually retribution for a similar act carried out by a Shiite extremist known as Abu Azrael (The “Father of the Angel of Death”). The Popular Mobilization Committee (PMC) oversees the forces that Abu Azrael helps lead. The PMC is directed by Abu Mahdi al Muhandis, a former commander in the Badr Organization who was listed by the U.S. government as a specially designated global terrorist in July 2009. The U.S. government described Muhandis, whose real name is Jamal Jaafar Mohammed, as “an advisor to Qassem Soleimani,” the commander of the Qods Force, which is the external operations wing of the IRGC. U.S. military and intelligence officials accuse Soleimani of overseeing the deaths of numerous American soldiers and other personnel in Iraq. In June, Muhandis was pictured with Iraqi Prime Minister Haidar al Abadi and then photographed with Abadi and Iranian President Hassan Rouhani during a high-level meeting. The photos demonstrate the high degree of coordination between Muhandis’ Popular Mobilization Committee and its Iraqi and Iranian government backers. Needless to say, the PMC and its allies in Iraq are not substitutes for the “Awakening” forces that were crucial in turning back the advances made by the Islamic State’s predecessor, AQI/ISI. Instead of clearing and holding territory from the Sunni jihadists, offering stability and governance in their absence, these Shiite extremists are escalating the conflict. The result has been that too many Sunnis who might otherwise prove to be key partners against Baghdadi’s enterprise have either brokered tactical alliances with the Islamic State, or have not received an appropriate amount of assistance to fight it. The situation is similar across the Syrian side of the border. Iran has buttressed Assad’s regime with IRGC commanders and Hezbollah fighters, who are not going to drive Sunni jihadists out of their current strongholds and then provide stable governance in the vacuum left behind. It was Assad, we should not forget, who originally turned the peaceful protests against his regime into a violent conflict that has now cost more than 200,000 lives. Assad’s use of barrel bombs and chemical weapons against Sunni areas are not a path to peace. Instead, Assad’s actions have only continued to radicalize the Sunnis who are needed as a long-term roadblock against the Islamic State, Al Nusrah Front, and other Sunni jihadists. 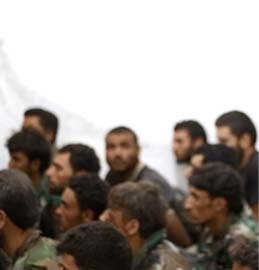 Many have noticed that the Assad regime does not often fight the Islamic State. It is wrong to say the two never clash, however, as they have throughout this year. But it is true that Assad’s war is primarily focused against others, namely, the part of the insurgency led by al Qaeda and its allies. The Sunni jihadists in this camp are opposed to both Assad and the Islamic State, but that should not make them a partner in any American-led strategy. Al Nusrah Front is a regional branch of al Qaeda’s international organization. Although Al Nusrah Front in Syria is often called an al Qaeda “affiliate,” it is better described as a regional branch of al Qaeda’s international organization. It is one of several branches, with the others being: Al Qaeda in the Arabian Peninsula (AQAP), Al Qaeda in the Islamic Maghreb (AQIM), Al Qaeda in the Indian Subcontinent (AQIS), and Shabaab (Somalia). 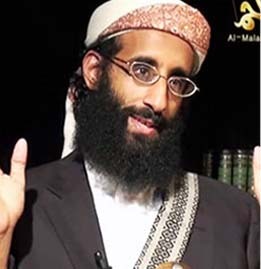 In each case, al Qaeda’s regional branch is headed by a jihadist who has sworn bayat (oath of allegiance) to Ayman al Zawahiri and has agreed to abide by the strategy and orders set by al Qaeda’s general command. However, each regional branch is afforded a great degree of discretion when it comes to waging jihad on a day-to-day basis. That is, al Qaeda’s chain-of-command is decentralized to a certain extent. This does not imply a lack of cohesion, however, as al Qaeda’s regional branches still openly follow the orders sent from al Qaeda’s top-tier leadership. Abu Muhammad al Julani, Al Nusrah’s leader, is a regional emir in al Qaeda’s organization. Julani was originally a subordinate to Abu Bakr al Baghdadi, but he helped establish his own group, in part, by defying Baghdadi’s attempts to keep Al Nusrah under his thumb. When Julani refused Baghdadi’s April 2013 order to fold Al Nusrah under the Islamic State, Julani publicly reaffirmed his direct allegiance to Zawahiri. Julani does not hide the fact that he follows the “orders” and “directives” of Zawahiri to this day. Al Qaeda bolstered Al Nusrah by sending a cadre of veterans to join its ranks. Al Qaeda is seeking to build an Islamic emirate (state) in Syria, but has a very different strategy for doing so. It is commonly assumed that al Qaeda is only interested in striking the West, and does not seek to resurrect an Islamic caliphate, or build emirates. But this is false. Osama bin Laden’s private discourse and public statements are littered with references to al Qaeda’s desire to build Islamic emirates and, eventually, a caliphate. The same is true for Ayman al Zawahiri, bin Laden’s successor. Al Qaeda has consistently supported the Taliban’s “Islamic Emirate of Afghanistan,” believing that it is poised for a comeback as Western forces draw down from the country. In Syria, and elsewhere, al Qaeda is pursuing a strategy that is focused on long-term nation building. Gradual implementation of sharia. As we’ve consistently warned at The Long War Journal, al Qaeda knows that most Muslims do not favor its radical version of sharia law. 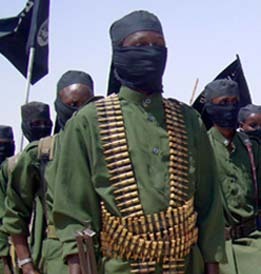 So al Qaeda’s leaders have taken steps to gradually implement sharia in the areas under its control. This is radically different from the Islamic State, which has fetishized hudud punishments, graphically displaying stonings, limb amputations, beheadings, and other grotesque executions (such as throwing “gay” men off of the top of tall buildings) in its propaganda. An al Qaeda veteran known as Abu Firas al Suri, who serves on Al Nusrah’s shura council and was formerly its public spokesman, critiqued the Islamic State’s approach in a recent interview. Al Suri accused the Islamic State and its supporters of confusing hudud punishments for the totality of sharia law, pointing out that there is more to the implementation of sharia than just lopping off a few limbs. Al Qaeda believes that hudud and other aspects of sharia should be fully implemented, but various factors necessitate a more gradual process for reorganizing society along these lines. Al Qaeda has concluded that fully implementing sharia before the population is ready risks alienating would-be supporters. Society needs to be re-educated as to the “correct” Islamic laws, al Qaeda believes. Al Nusrah and other like-minded jihadists have, therefore, established schools for spreading their ideology throughout Syria. An “erupting jihadi center.” Indeed, this remains one of al Qaeda’s chief aims: to spread the salafi-jihadist ideology that motivates its terrorism and violence. As the aforementioned Abu Firas al Suri explained in an Al Nusrah propaganda documentary released earlier this year (“The Heirs of Glory”), al Qaeda seeks to spark revolutions throughout the Muslim-majority world. For decades after the fall of the caliphate, the “concept of jihad in the Levant was absent from people’s minds,” Abu Firas said in the video. “Nobody even heard of the word jihad. In reality, the Levant is regarded [as] one of the most important centers in the Islamic world due to its close proximity to Palestine, to the Hijaz [Saudi Arabia] and being in the center of the Islamic world.” Abu Firas then introduced viewers to the concept of an “erupting jihadi center,” not just in the Levant, but elsewhere. And he drew on Marxist thinking to explain what he means. “The existence of a continually erupting jihadi center in the Levant is critical so people continue to hear about jihad,” Abu Firas said. “Even western theorists, such as Frenchman Regis Debray, author of ‘Revolution in the Revolution,’ confirm the necessity of a continually erupting center for revolutions.” Debray’s book dealt with guerrilla warfare, especially in Latin America, and the revolutionary approaches employed by leftwing radicals in the mid-20th century. Abu Firas was quick to say that “obviously” Debray “is not our role model or example, nor [Fidel] Castro, nor [Che] Guevara, but rather this is a fact.” By this he meant that no leftwing Western intellectual or Marxist can serve as the jihadists’ “role model.” But his explanation of revolutionary theory is telling, as it is known from various sources that al Qaeda has studied Che Guevara, Mao and other political revolutionaries in order to better understand their successes and failures. Embedded within the Syrian insurgency. Consistent with al Qaeda’s revolutionary approach, Al Nusrah has embedded itself deeply within the anti-Assad insurgency, seeking to win popular support for its ideology by becoming indispensable to the fight against an unpopular regime. In insurgent terms, this might be called a “bottom-up” approach, which is designed to garner wider support from the Syrian population. This stands in stark contrast to the Islamic State’s “top-down” authoritarianism, which demands that everyone, including other jihadists, submit to Baghdadi as the “Emir of the Faithful.” Al Nusrah’s strategy has borne fruit. When the U.S. moved to designate Al Nusrah as a terrorist organization, other non-jihadist rebel groups vehemently objected. Such was the popularity of Al Qaeda’s effort at the time. Zawahiri himself made this point in a recently “leaked” letter (written in September 2013) rebuking the Islamic State’s leadership. Indeed, Zawahiri had ordered Al Nusrah and other groups to keep their al Qaeda identity a secret at first – all the better to avoid Western scrutiny and increase the jihadists’ connection to the people. In addition to Al Nusrah, there are various other jihadist groups in Syria that maintain some degree of affiliation with al Qaeda, even if the exact nature of the relationship is not altogether clear to outside observers. For instance, Jund al Aqsa is almost certainly an al Qaeda front. Jaish al Muhajireen wal Ansar (JMWA, or “the Army of the Emigrants and Helpers”), which merged with Al Nusrah earlier this month, was linked to al Qaeda prior to being folded into Al Nusrah. The same is true for Ansar al Din, a coalition that until recently included JMWA. The Turkistan Islamic Party, Uzbek groups, Chechens belonging to an arm of the Islamic Caucasus Emirate, and others all have demonstrable ties to al Qaeda’s international network. And then there is Ahrar al Sham, a powerful rebel organization that has had al Qaeda veterans in its most senior ranks. Al Qaeda’s desire to hide its hand in these and other groups is entirely consistent with its approach to guerilla war fighting. Also consistent with al Qaeda’s revolutionary approach, Al Nusrah has entered into a series of coalitions with other insurgents fighting Assad. The most successful of these, of late, is the Jaysh al Fateh (“Army of Conquest”) alliance, which is led by Al Nusrah and its close jihadist ally, Ahrar al Sham. In March, Jaysh al Fateh captured the city of Idlib, which was only the second provincial capital to fall since the beginning of the uprisings against Assad. Since then, Jaysh al Fateh has cleared Bashar al Assad’s forces out of a large portion of the Idlib province. From this position, the jihadists threaten Assad in both central Syria and in the coastal Latakia province, an Assad family stronghold. Seeds of an emirate. With the consolidation of its grip in the Idlib province, Jaysh al Fateh has laid the groundwork for a potential Islamic emirate. As a leaked audio speech of Julani shows, this is clearly Al Nusrah’s long-term intent in Syria: to create an Islamic emirate under which sharia law is fully implemented. Al Nusrah’s “The Heirs of Glory” also explicitly underscores the importance of Syria to the jihadists’ caliphate-building project. Al Qaeda and its allies still face many obstacles on their path, and their success is far from guaranteed. But it says much about al Qaeda’s long-term strategic planning that Jaysh al Fateh has almost certainly captured more territory from the Assad regime this year than the Islamic State has. Obviously, this is not what the CIA and the Pentagon had in mind. We are now in a world war. After the Cold War this is World War IV. It’s been on for years. Islamic State has actually blurred the battle lines and alliances. No. Its a Regional War & not a very big one at that. Even if one were to include whats happening in Africa, the Sinai, other parts of the Arabian Peninsula & the AfPak Theater its still just a Regional War. no, history witnesses that it is no regional war, but a clash of civilizations…if they are at war with you, you can whistle dixie all you want to but their goals are global and you can’t change that fact.. The war in Syria is not happening in a vacuum. Islamic Jihadists are fighting in many countries and conducting terrorist attacks all over the world. It’s all connected. Syria has some of its own story lines, but this is a world war. But, mike, you’ve made your opinion known, you don’t think it’s a world war….fine. Go back to cheerleading the Russians. I will agree that bold military moves from a strong leader earn respect from those of us who care about world events. Fret not about “cheerleading for the Russians/Putin. He is doing just about every Nation with a stake in this Middle East ‘conflagration’ a favor. Besides Turkey, the GCC Members, Pakistan & possibly a couple of other Muslim Nations everybody else is privately welcoming this intervention on Putin’s part. WWI & WWII had just as big ‘tug-o-wars’ taking place in the arena of ideas as today’s conflicts. The only difference being technology. Great testimony, Tom. If over most people’s heads (inside jihad baseball). The only way to win this is to make common cause w Assad and the Russians (and Iran). Wipe the Syrian map clean of anyone who puts religion before national law and have Assad hand off to an elected successor, as he’s indicated he would do. It won’t be pretty, but the recent Jirga in Afghanistan that resulted in two presidents wasn’t pretty either. Eat crow, shut up about Assad (he’s fighting for his regime’s survival, go read about General Sherman for an American comparison), help Putin wipe out the vermin with joint airstrikes and put a UN blue-helmet force in as soon as possible to patrol a safe area/no fly zone. That will go a long way to easing the refugee pressure on Europe, and will put some muscle behind recent UN initiatives. I earnestly appreciate your latter comments and observation on the “bridging” proposal not only with the Chinese but with the Russians. The landscape has changed and although Russia isn’t approaching the US with open arms, nor China for that matter, we cannot simply marginalize these superpowers or discount their interests in the world. Its time we get back to splitting things up again and running this world in an orderly manner. I am fully aware that some on the left and fewer on the right see it this way but it’s reality. The rose colored glasses need to come off and I hope our next group of leadership understands the complexities of the world in the 21st century. Looks like the Chinese and Russians are moving together in concert. Obama will have another chance to lead (lose) from behind. This analysis is excellent. The significance of clearing territory because of the centrality to the Islamist enemy of conquering and holding territory is noteworthy because territorial conquest is seen as proof of favor by Allah. Military conquest is especially important for anyone claiming a “caliphate,” such as the “Islamic State,” just as it was a critical part of the success of the original Caliphate. Therefore, it is vital to defeat such Islamists militarily, which particularly means to liberate territory from their control and to prevent them from ever retaking it. Assad isn’t going anywhere soon but there is no end game where he or the Alawite mafia will be allowed to peaceably rule over the bulk of Sunnis again. Syria is done. If Assad has the Russian AF and Iran behind him, he could, at least, keep the capital and Latakia. I don’t think Putin gives a rat’s tail about “Syria” as a sovereign state, only as a jihadi factory and a warm port. This is certainly a damning article as it pertains to the competence of the current administration and our uniformed “leadership” in the Pentagon. It would appear that taking this article at face value, that the military intervention is being mishandled due to lack of understanding. I would go so far as to say that, in particular, the Commander in Chief, his Secretary of State, and primarily his advisors in the Pentagon can’t seem to get much of anything right. What successes are obtained seemed to be achieved through the use of brute force and coincidence more so than as a result of design. I suppose elections do have consequences. And here i was 7 years ago very disillusioned by the Neo-Cons and the former occupant of 1600 Penn Ave. Excellent work as per usual. The complexities of the situation on the ground is mind boggling. I fear for my children and grand children and their children, they are the ones who will be dealing with all of this when we are wel gone. It’s enough to make me weep. The whole instigator and initiator of this nightmare going on in Syria IS a$$ad! Why can’t people see that for what it is? For all you people looking to Putin as being some sort of savior in this situation, all I can say is what a bunch of losers you must be. a$$ad has been stabbing US in the back from day one of this thing. Even during OIF, he was allowing his territory to be used as a staging ground and entry point into Iraq for terrorists, and the major provider of such. Why would he do so? Because he saw a free and independent Iraq as a direct threat to his power. This is what we’re up against folks. This is what the planners in the previous WH failed to take into account. Putin is setting a trap. Don’t fall for it, America. Putin is acting as the spoiler and sourpuss. Syria has no value to Putin. But what he does see in Syria, is a chance to drag down (GET EVEN with) both the US AND Western Europe. This is how you do it, baby. Put the hurt and fear on these vermin. Lists aren’t enough. Activists say the Islamic State group did not hold Friday prayers in several mosques in its de facto capital of Raqqa in northern Syria, fearing Russian airstrikes. The Britain-based Syrian Observatory for Human Rights said a drone carried out strikes on an IS-run camp near Raqqa on Friday. It had no word on casualties. A Raqqa-based collective called Raqqa is Being Silently Slaughtered said several mosques were evacuated for fears of airstrikes. 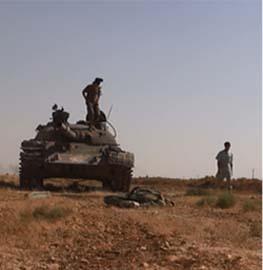 The Observatory said air raids near Raqqa Thursday killed 12 extremists including a Tunisian and an Iraq. The Observatory said it was not clear if the nine air raids were carried out by Russian warplanes or those of the U.S.-led coalition. 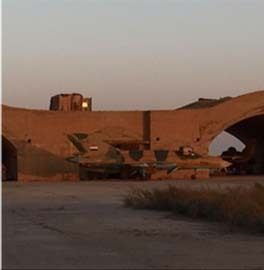 Tom, I wonder what you think of this view of the enemy strategy… that Z may be preparing a strike alongside Hamza BL. Lots of insight here into Z’s light but steady mgmt. hand. “What remains an open question is why Hamza bin Osama bin Laden was placed center stage at this time. The simple answer may be that he can provide the organization the psychological link to the man who many consider to be the founder of the Jihadist movements, the man called the Lion of Jihad; but is the son the Lion’s cub? Tikrit contradicts virtually all the article had to say, although that is outdated as well now. Syria and Iraq have become a ideological Struggle never before witnessed. China will weigh in next month for a slice of the pie. US is relying on a Sunni outrage supporting Saudi, Turkey and some GCC Nations, Allah isn’t helping so far, the Hajj will make most Muslims think twice. Arjuna the Syrian Observatory for Human Rights (SOHR) has been on the news of late. Basically it’s a one man show ran from a two bedroom house. 10-4. Rami Abdulrahman is a dedicated guy. I hope he’s right about many bombs falling from different platforms, even from Russian and US (?) planes. But given our timid, casualty-averse (cowardly?) style these days, I bet we hightailed it (at least w anything manned) when the Russkis said get out. What’s up with the Chinese? Debka and a few sketchy online sources are the only ones mentioning the carrier. National Interest says non-operational for sure. Where is it right now?